An automatic recount will likely be triggered in the race for Florida’s Senate seat. As less than half a percentage point separates current Governor Rick Scott and current U.S. Senator Bill Nelson. The outcome may hinge on an unusual voting pattern reported in Broward County. The Florida Gubernatorial race and contest for state Agricultural Commissioner also appear to be heading for recounts. 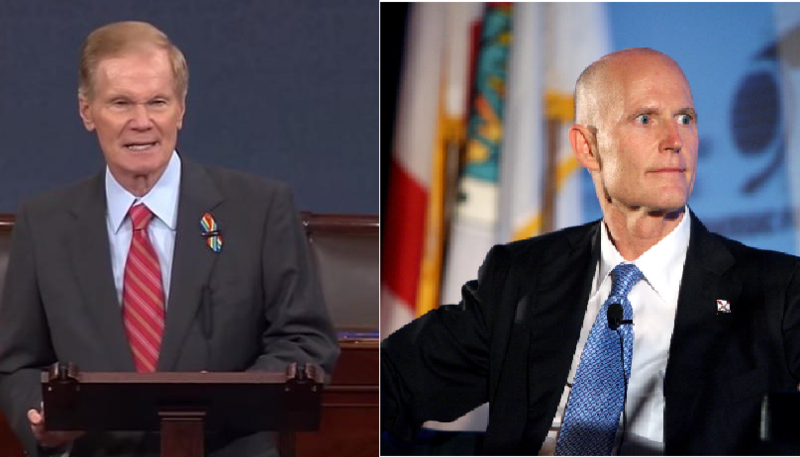 Sen. Bill Nelson and Gov. Rick Scott. Marc Elias is a lawyer representing the Nelson campaign. He says the canvasing process, certifying provisional ballots, and the expected recount will all pick up more votes. Which could bring the race even closer. If the candidates are within a quarter of a percentage point, Elias says that means a hand recount. “What we are likely going to see in a hand recount is a whole bunch of ballots that for one reason or another, either due to calibration issues or ballot marking issues, were not counted that will be counted as part of a hand recount. That’s the simplest explanation, I think it’s the most straightforward explanation, and it’s the one supported by the data,” Elias says. Elias says the focus will be mostly on Broward County, due to an “ahistoric” undervote. An unusual number of voters skipped the race at the top of the ballot, only voting for races further down. He says undervotes are uncommon, as most voters tend to do the reverse and only vote for bigger races at the top of the ticket like the Senate and Gubernatorial contests. Elias says the undervote in Broward could signal something else is going on: like malfunctioning voting machines or poorly marked ballots. "You know, if you go and you look at past recounts, you see that voters mark ballots in a whole host of ways, where voter intent is clear, but where machines can’t pick them up. Partially filled in ovals, X’s in ovals, circling the names and the likes,” Elias says. But ballots marked incorrectly, or misread by the machine, would be counted during a manual recount. Elias says canvasing will finish Saturday, and if the results show the margin between the candidates at half a percent or less, it’ll trigger an automatic machine recount, which will wrap up by next Thursday. If those results show a quarter percent difference or less, a manual recount will begin. Dianne Williams-Cox overtook opponent Bob Lotane to win Tallahassee City Commission seat five. The seat was formerly held by Gil Ziffer. Williams-Cox pulled off the win with about 65 percent of the vote. Florida’s statewide elections have wrapped, and Republican Ron DeSantis is now governor-elect. Tallahassee Mayor Andrew Gillum lost the race, but is vowing to continue fighting for the causes that drove his campaign. John Dailey is Tallahassee’s new mayor, he will replace Andrew Gillum for the job.